It was a whirlwind 4 days but so productive. 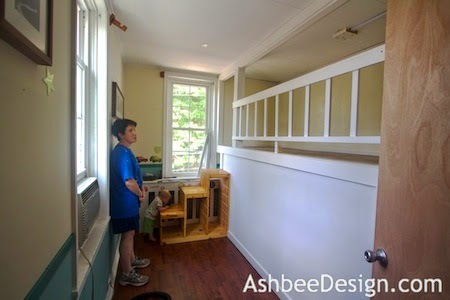 The goal was to change a medium sized bedroom (12 x13') into 2 separate bunk rooms. 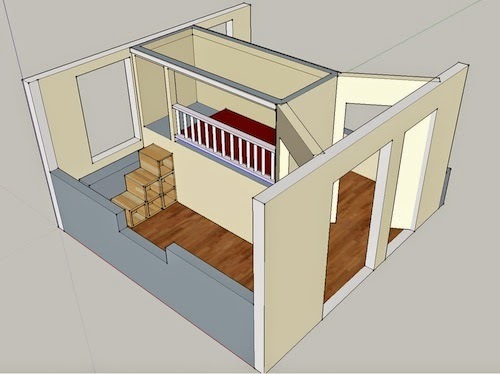 I shared the plan here and now have photos of the process. Remember, this was designed to be built in Connecticut, loaded into our small pick-up and delivered and installed in Pennsylvania. Here is the truck arriving in PA. Neighbors helped move all the panels up the 10 steps to the front door and then then up again to the second floor bedroom. Here is the room that we were dividing. Our daughter had just about emptied it out before we arrived. And I'll skip right to the end to show where we left this same room 3.5 days later. Here is a view of the top bunk side - the mattress hasn't be moved back in yet. 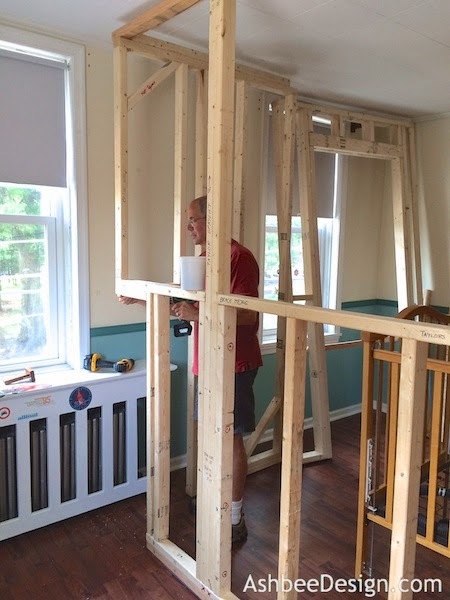 But we had successfully re-assembled, insulated, drywalled, taped, spackled, and trimmed the entire structure including hanging 2 doors. 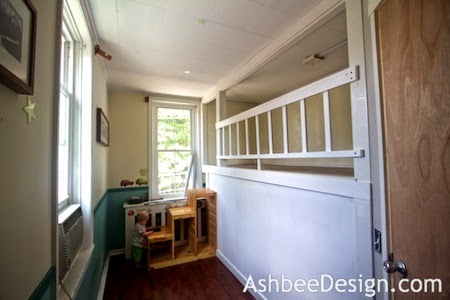 The new space is decidedly small but each half gives both grandchildren needed private space. Logistics were tight. 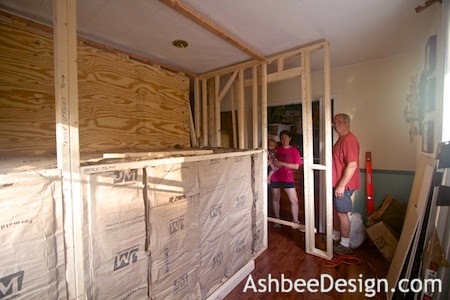 The plan included the order pieces arrived at the 2nd floor and where they were put. This is beginning assembly. 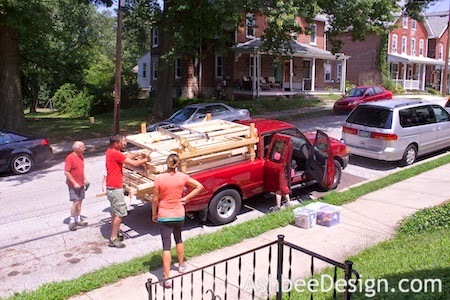 Larger panels had been divided into smaller units to fit in the truck. Those pieces had to be reassembled. Luckily, I love jigsaw puzzles! Several pieces of furniture including the crib needed to stay. That just added to the logistical issues. The first walls are getting connected below. The pieces did fit! It was constructed 1.5" shorter than the room and as a free-standing structure. 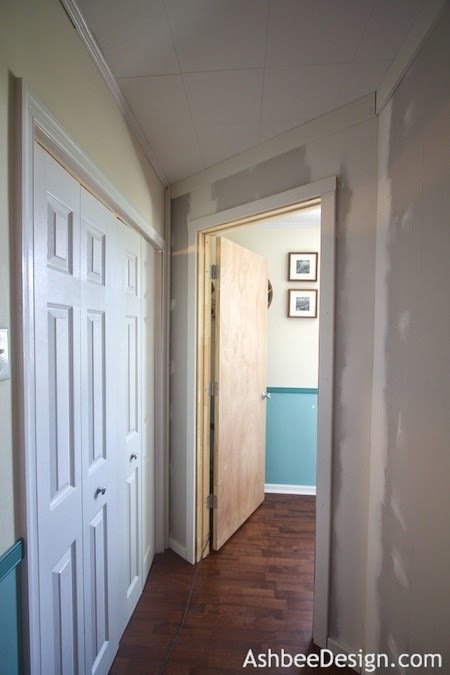 There are a few hidden screws that attach it to existing studs near door and window frames but the entire unit can be taken apart and removed with very minimal repairs needed to the original room. Later trim was added to cover the gap at the top but that space was needed to allow us to swing the walls up into place. We had a team of 4 and in order to be most productive, different things were happening all the time. 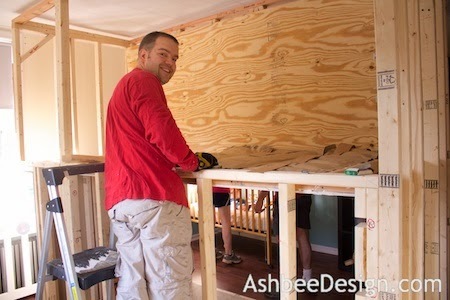 Josh started insulating even before all the walls were in place. 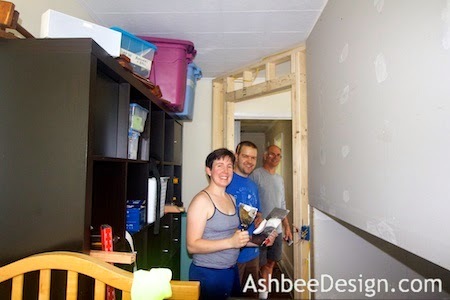 After the bunk unit was in location, the door walls were added. These went at an angle and create a small hall space that had access to the exisitingwalk-in closet. Josh was the one with electrical experience. He relocated the ceiling light to add a light over each door. You can get a glimpse of some of the directions written in marker to help with reassembly. I had jotted little notes everywhere- and they definitely helped! Amy became chief taper and spackler. She has skills slinging the mud! 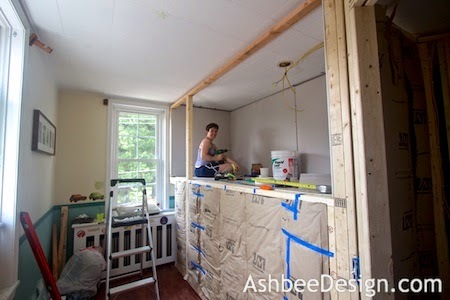 Drying time for the spackle held up progress more than anything else, and she had purchased the quick dry variety. Here is a partial view of the side with the lower bunk. 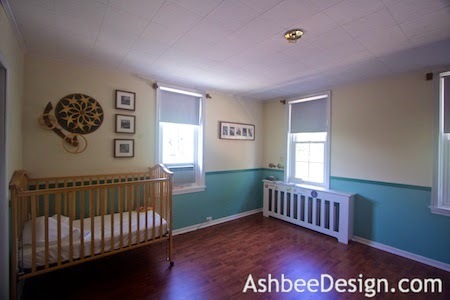 That half saw less attention because the baby had alternative sleeping quarters. My grandson (visiting his other grandparents for these few days) was going to need a sleeping spot upon his return. And pictures are few because this side was also storage space for stuff. Both sides are the same finished dimensions. This side has one window. David was chief problem solver and kept me sane. He worked in tandem with me just getting it all together. What a team! 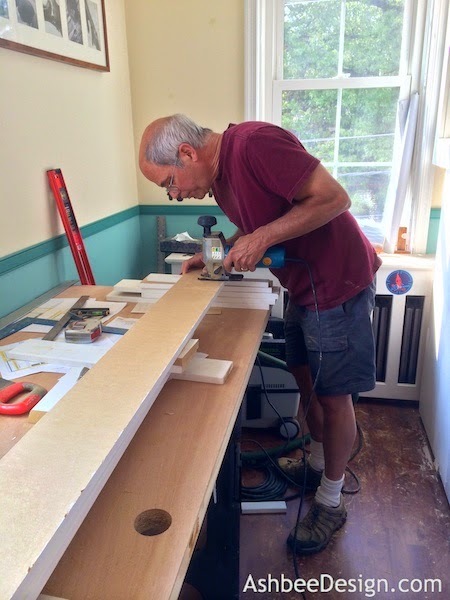 We set up a crosscut saw table for doing the trim work right in place. Talk about tight quarters. 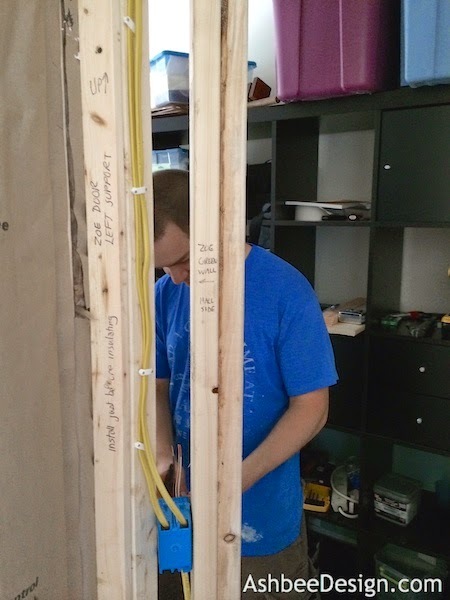 Here David is fine tuning the trim to fit against existing trim work. By this point we knew everything was going to work. The toughest part was hanging the doors. 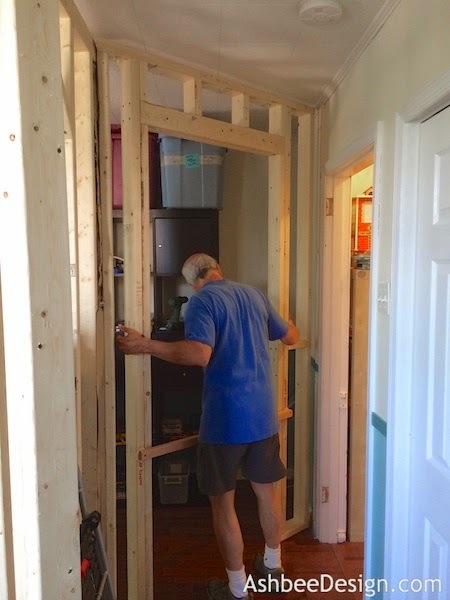 I had used pre-hung doors but I haven't installed any in about 35 years. There was a learning curve there! First door took about 3 hours to get it swinging to our liking. The second took about 30 minutes. Amy is still spackling and David is trimming. This is the first time we have had access to both a crosscut saw and a nailing gun for a construction project. Very nice on both counts! 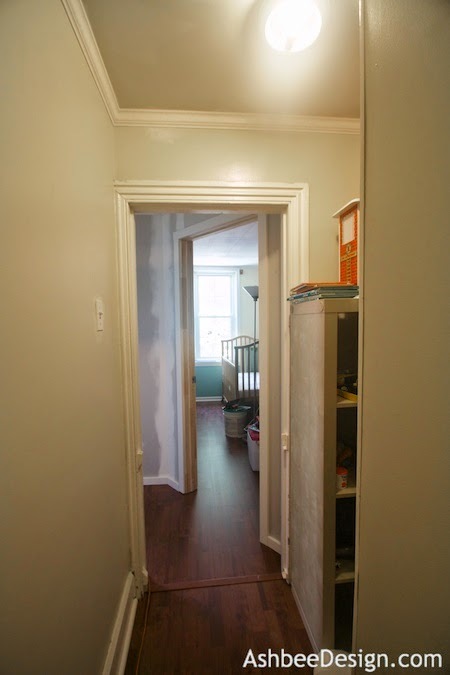 Below view is from the current hallway looking through the original bedroom door. You can see straight down Zoe's bunk room. 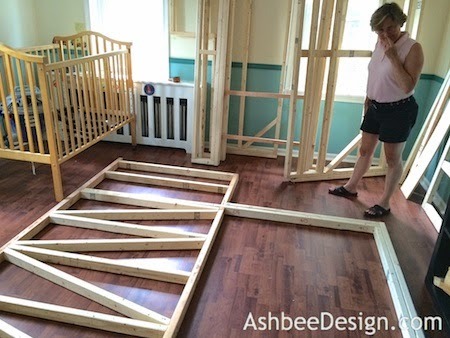 The crib will move out once she is ready for her "big girl" bunk bed. For now that will be a play platform. 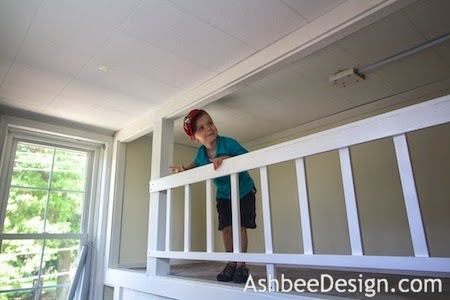 Here is a view down the new hall located between the 2 bunk rooms. The shared double closet is on the left. Each day, Taylor got to visit and see the changes. He is a very excited little boy and looking forward to the new digs. Access to the bunk bed is via an IKEA step storage unit. Levels were designed with that in mind. Drawers and toys still need to be moved in. We left exhausted and not 100% complete. We did manage to finish to a point where Taylor's side was close to done. First coat of paint was on the walls. Amy finished it that night and Taylor came home for a nap in the new bed the next day. Since that day, Amy has continued working. 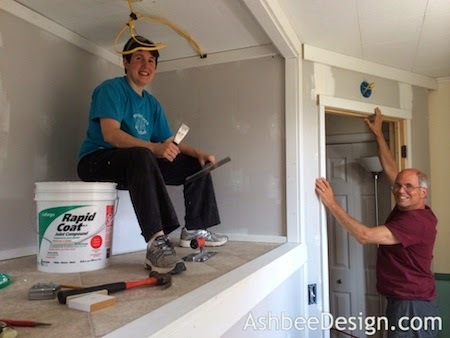 She has painted all the trim on Taylor's side, caulked the remaining trim, finished spackling and sanding Zoe's side and the hall and hopes to prime those this weekend. Meanwhile Taylor's bed has been made and he has a cozy nook for sleeping. Hopefully more photos will follow! Wow, that is a lot of work but amazing to see it all come together after you showing us the plans. Lucky grandkids.